The last of Britain's piston engined fighters, and to many, one of the most elegant too, the Sea Fury was born of a time when jets were gaining favour in the military, yet still had sufficient performance to be effective. In fact, a Royal Navy Sea Fury was the first aircraft to shoot down a Mig 15 in combat. 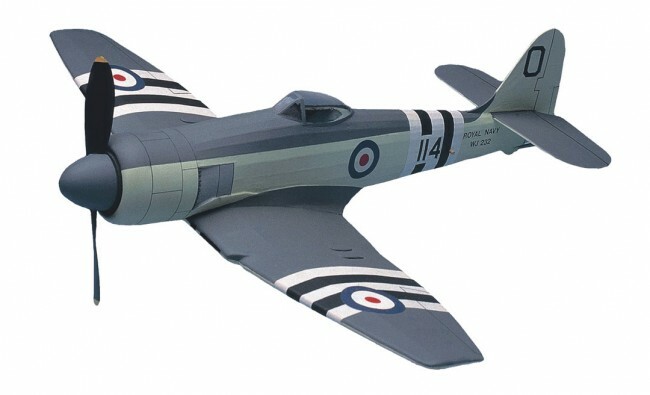 This version of the Sea Fury has the good scale outline of the original yet retains excellent flying attributes from careful attention to detail and effective design. The characteristic 'elliptical' wing is faithfully followed and combined with an effective wing section, gives good lift with minimal drag. Despite that elliptical shape, the wing still retains good slow speed performance and is not prone to tip stalling. Construction is in three sections to faithfully recreate the shape of the original. Wing ribs and trailing edges are printed on balsa sheets for easy cutting and accurate assembly. The fuselage is built up from balsa formers that need to be cut from the printed balsa sheets provided. Careful choice of wood makes this a joy rather than a chore. Each half shell is assembled over the plan and then joined together at the end. Areas so characteristic to the Sea Fury, such as the exhaust shields, are reproduced with balsa sheet to make accurate scale details that set West Wings kits apart from other makes. You can choose to fit a 'knock off' scale undercarriage or leave her 'clean'. The parts are there, it's your choice! You've even got a printed instrument panel that is accurate and adds a stunning feature on such a small model. With such a nice canopy to view it, it would be a crime to leave it out. The kit includes: Plastic propeller and Rubber Motor, Wheels, Canopy, Spinner and full decals.